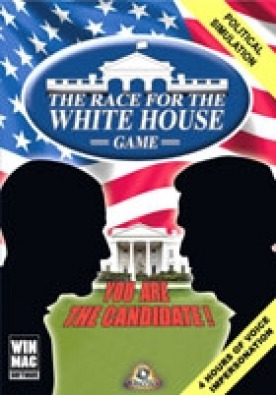 ABOUT THE GAMETravel around the United States, try to woo voters across thecountry, create your own political agenda, skillfully manage yourcampaign budget... and perhaps you will be the next White Houseoccupant!KEY FEATURESA presidential election simulation game with realistic elementsfor political neophytes and serious political junkies! Nearly 20 playable and customizable candidates Features … 3D animated faces and voice imitations of real political personalities Hundreds of policy proposals and playable locations taken from actual political campaigns and agendas Marketing campaign: TV spots, poster campaigns, Internet campaigns, and human billboards Campaign budget management: establish HQs; organize rallies; gather donations from super PACs, lobbies, and other kinds of organizations... Media involvement: televised debates, press events, TV shows, election night results... Low blows: rumors, fraud, discrediting your opponent... that's politics, too! Continuously appraise statistics and poll results on participating candidates on the game's website!Several game modes Take on an opposing candidate controlled by the computer, or by another human player online with internet rankings Realistic mode: Run for office with actual opinion polls and vote projections Equal Start mode: All candidates start with equal poll resultsSYSTEM REQUIREMENTS XP / VISTA / 7 / 8 1.6 GHz Processor or higher 2 Gb RAM 2 Gb Hard Drive Space DirectX 9.0 or higher © Eversim 2012, All rights reserved.